Walking along the deck feels a bit like you are entering a 3-story tree house. The glass french doors lead you into the great room where you’ll find cathedral ceilings with plenty of windows to enjoy the forest from indoors as well as out. The open living space contains a fully equipped kitchen with dishwasher, large dining room table, and living room. Down a short hall on the main floor are two bedrooms, and a full bath. Both bedrooms have queen beds. Walk up the stairs to the loft which overlooks the great room, and get another wonderful view of the windows looking out to the hardwood forest. In the loft you'll find a third bedroom with a king bed, a bathroom with jacuzzi tub, and a sitting room. At Chanterelle Chalet you'll also enjoy a partially furnished basement with equipped game room, wood stove insert for heat in the winter, and a third full bathroom. 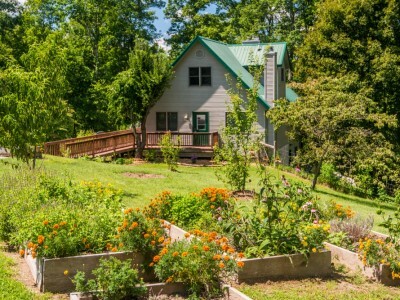 The house is at the end of a road that dead-ends into the forestry, and lies on a large piece property adjacent to state forest, providing ample privacy and great forest viewing! Relax in the hammock and enjoy the spectacular colors of the leaves in the fall, go for a long hike and watch the birds and other wildlife, listen to the sound of owls and whippoorwills while you star gaze or sit by the outdoor fire pit in the evenings. Test your naturalist skills in identifying the vast number of mushrooms, plants (medicinal and other) and tree species that grow around the property and in the adjacent forestry. The house has central air and heat as well as a wood stove insert with glass door in the basement, so you'll be comfortable no matter what time of year you visit. Children will have fun playing in the sand pile and on the swing set, as well as in the game room downstairs, and televisions with DVD players are located on both the first floor and in the basement, with basic Direct TV. Your well-behaved dog is welcome, and the house has a large fenced pet area on the side of the house where he/she can enjoy the outdoors without you worrying about them (note, obviously test the fence for your animal before trusting them there, as a few smart dogs have figured out how to climb or otherwise escape, although most remain contained and content. Also note that several of the neighbors have horses, dogs, cats and chickens, so please be respectful that your animal doesn't disturb them). The house is five minutes from Lake Lemon and Danny Smith Park, 15 minutes from Nashville, IN, Brown County State Park, and Bloomington, IN. It is about 20 minutes from Lake Monroe and Indiana University--and functions as a great place to stay with family or friends for IU games and events. The house is also close to IU hospital, Yellowwood state forest, Morgan Monroe state forest, and the Tecumseh trail, as well as miles of popular biking roads. Come nature enthusiasts for the fall colors, wildflower viewing, mushroom hunting, long bike rides on the country roads, hiking, or just a place to escape, relax and unwind!